Coventry Carol changed my life. I didn’t know it at the time, and it took some years for it to filter through, but it did, and profoundly. It was 1984, I was 19 years old, and I was in the upper part of Coventry Cathedral, the portion that was bombed in World War II and left standing as it was, open to the weather. 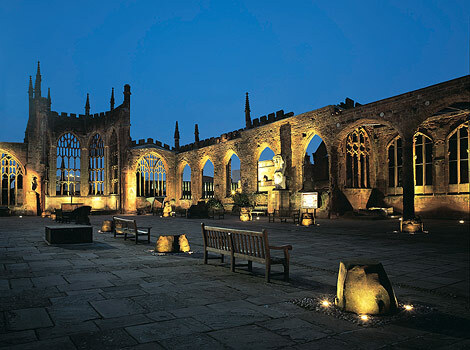 It was evening, it was dark, the place was floodlit, and I was there to see the biennial performance (as it was then) of the revived and reconstructed Coventry Mystery Plays. This was the slaughter of the innocents scene. The story is from but 1 verse of the New Testament, Matthew 2: 16, in which Herod the Great massacred the male children of Bethlehem two years old or younger in the hope of killing the Christ child. There is no evidence that it is historical: it is based on Moses’ childhood in Exodus, and neither the other Gospels nor any other source makes any mention of it. 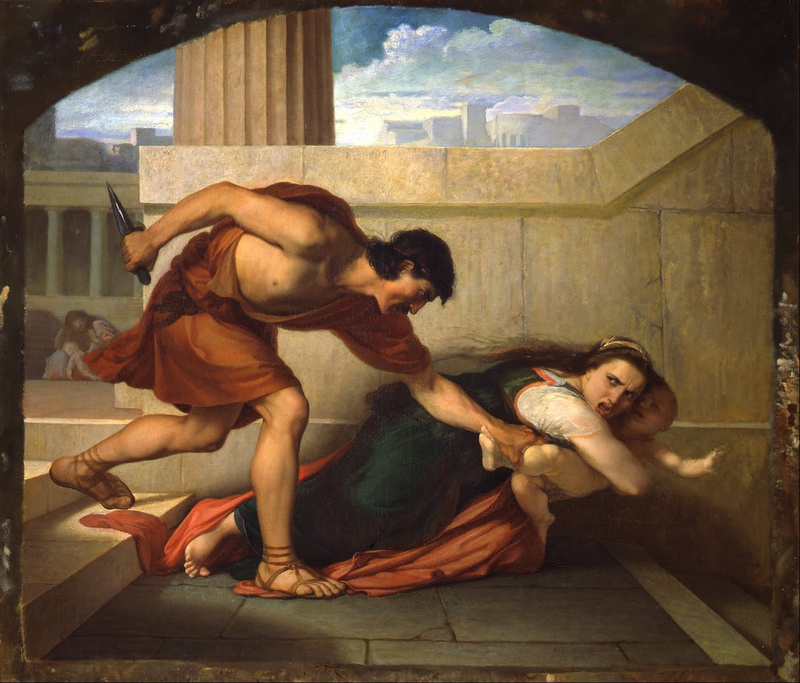 The story may be based on other instances of Herod’s behaviour, though, as the 1st century Jewish historian Flavius Josephus reported that Herod ordered the killing of vast numbers of people at his death so that the entire nation would have to mourn him. And he did kill his own wife and two sons. Click picture to play video (which opens in a new window). A first hearing of Coventry Carol, described then performed. In the interview I mistakenly said there were two texts for the song, an idea corrected in the article below. Most major towns had a unique cycle of mystery or miracle plays, up to 48 in a cycle, though not all would be performed in a particular year. Lack of clear evidence prevents us from knowing how far back the tradition of mystery plays goes, but we do know that from 1210 they were in the hands of the various craft guilds, taking a section of the story each, performed on or around the festival of Corpus Christi, a movable feast between late May and mid June. We now have only a handful of complete or nearly complete cycles: the York, Chester, Towneley, and ‘N Town’ cycles. The whole Coventry cycle did not survive, but from it we have two plays. The Pageant of the Shearmen and Taylors dramatises the nativity, from the annunciation to the massacre of the innocents. This is a manuscript dated 1591, including Coventry Carol and other songs. The Weavers’ Pageant follows the story from where the Shearmen and Taylors ended, with the purification of the Blessed Virgin Mary, the presentation of Christ in the Temple, and Christ and the doctors. The Weavers’ Pageant is preserved in two manuscripts, now classified as Coventry City Record Office Accessions 11/1 and 11/2. 11/1 is the presentation of Christ in the Temple, written on 2 leaves of handmade paper, in brown ink in a 15th century script known as secretary hand. The original manuscript of a play was kept by the town council and, when a copy was needed, the copyist applied and was charged a large fee for the privilege: 11/2 is clearly derived from just such a base text of the Weavers’ Pageant, prepared for the weavers’ guild by Robert Croo in 1534 at a cost of 5 shillings. The manuscript of the Shearmen and Taylors’ Pageant was destroyed in a fire at the Birmingham Free Reference Library in 1879. As luck would have it, very shortly before in the same year, Coventry antiquarian Thomas Sharp had made a copy, and in 1817 he printed 12 copies “for the purpose of bringing it more immediately to the knowledge of his antiquarian friends.” He published it again in 1825, in his Dissertation on the Pageants or Dramatic Mysteries Anciently Performed at Coventry, by the Trading Companies of that City. Thomas Sharp found out about the survival of the Weavers’ Pageant later and published it through the Abbotsford Club, a Scottish antiquarian society, in 1836. It wasn’t only antiquarians such as Thomas Sharp trying to preserve the past. The seeds of England’s cumulative break with Rome were sown in 1527, when Henry VIII had an ecclesiastical court meet to discuss the validity of his marriage to Catherine of Aragon. When his wish to divorce Catherine and marry Anne Boleyn met with Rome’s repeated and implacable resistance, Henry declared himself Supreme Head and Sole Protector of the Church in England in 1531. The final stage came in November 1534, when Henry passed his Act of Supremacy, declaring England to be a sovereign state, in no way subject to Rome, with the King as Supreme Head of the country and Supreme Head of the Church of England, with the power to define the faith, declare heresies, and appoint men of his choosing to key ecclesiastical positions. This was the beginning of the Church of England. In the years that followed, whoever took the throne set the tone, and when the monarch changed, so would the respective fortunes of Catholics and Protestants. Edward VI (ruled 1547–1553), Protestant son of Henry VIII and Jane Seymour, reigned after Henry. Edward was succeeded by his half-sister and nominal Queen of England, Protestant Lady Jane Grey, for only 9 days in 1553. Lady Jane Grey’s attempted reign was an unsuccessful bid to prevent the accession of Mary I (1553–1558), Catholic daughter of Henry VIII and Catherine of Aragon, who was succeeded by Elizabeth I (1558–1603), Protestant daughter of Henry VIII and Anne Boleyn. 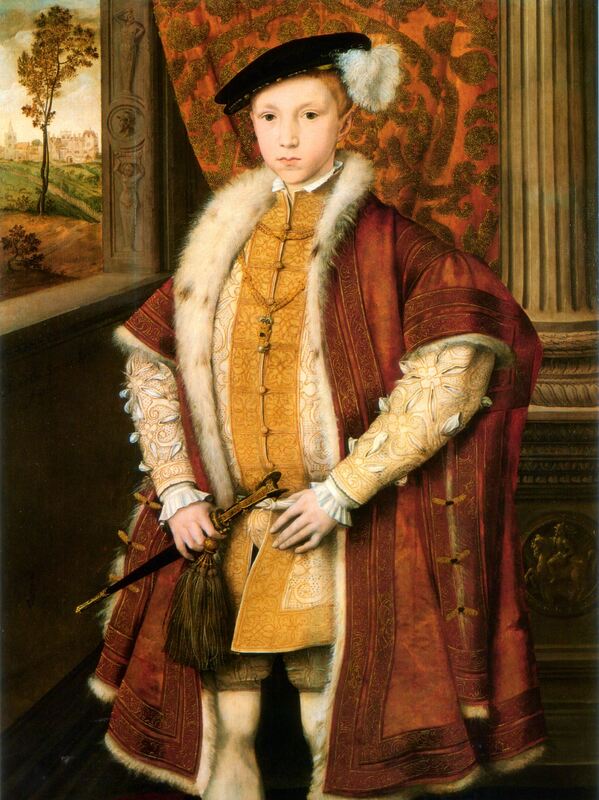 Edward VI at 9 years old, 1546, painter unknown. The clothes, the pose and, upon succession, the King’s actions, all evidence of the boy carrying on his father’s work. These potentially dangerous religious changings of the tide put the mystery play tradition in jeopardy. The succession of Henry’s 11 year old son, Edward VI, in 1547, marked an enthusiastic hastening of Protestant reforms by the new King, his Council, Protectorate, and the Archbishop of Canterbury, Thomas Cranmer. This was a campaign to rid national life of any signs of Catholicism. The mystery plays were timed to coincide with the Feast of Corpus Christi, which celebrated belief in the Real Presence of Christ in the Eucharist. This could only be seen as a pungent reminder of the old faith, and the mystery plays were inextricably associated with it. When, in 1548, the Feast of Corpus Christi was abolished, the mystery plays lost their date in the calendar. They moved to Whitsun week. Offers to strip the plays of any Catholic vestiges helped to keep the tradition going, and stave off local authorities’ moves to suppress this localised and widespread tradition of popular religious drama. Under King Edward VI, the plays of the Death, Assumption, and Coronation of the Virgin were excluded, being expressly Marian. Under Queen Mary, who re-established Catholic rule, they were reinstated, only to be suppressed again under Queen Elizabeth in 1561. In 1570, Pope Pius V excommunicated Elizabeth from the Catholic Church, claiming that national ungodliness had grown and that “Elizabeth, the pretended queen of England and the servant of crime, has assisted in this.” He declared that the Church excommunicated Elizabeth “out of the fullness of our apostolic power”, describing Elizabeth as “a heretic and favourer of heretics”. Pius V stated that she was “deprived of her pretended title to the aforesaid crown and of all lordship, dignity and privilege whatsoever.” This was clear authority, from the Pope himself, for Catholics to dethrone the Queen. It was a crisis that had been approaching for some time, and it could only have a negative effect on the mystery plays, rooted in the old faith. The cycle was played for the last time in York during Whitsun week of 1569. The Pater Noster play (Jesus’ giving of the Lord’s Prayer) was performed in 1572, but the play books were called in for inspection by York Minster and never returned. This background makes the dating of the Coventry mystery play manuscripts highly significant. Henry VIII’s concluding Act of Supremacy was passed in November 1534. Robert Croo’s manuscript of the plays was dated 14 March 1534, only 8 months before. This was during Henry’s final crescendo of anger at Catholic Church authority. Henry had made no attempt to suppress mystery play performances, but the writing was on the wall. The second Coventry manuscript, including Coventry Carol, is from 1591, 43 years after mystery plays had been threatened, then revived, then suppressed again in a climate of fear. In the 1591 manuscript, someone was eager to remember and document a long and well-loved tradition to prevent it fading from memory. With the mystery play tradition gone, with so much of what was written down lost, and with the unintended destruction by fire of a manuscript that did survive, it is only by several strokes of luck and good timing that we have this song and the drama that carried it at all. When I first heard Coventry Carol, sung spine-tinglingly in pitch darkness by a lone female voice; then, as the lights slowly faded up, two, then three voices, something very powerful happened inside me. I understood, I think for the first time, the full potency of a song. I understood it, not from an academic, intellectual, researched point of view – though all of that is important – but on the level of my experience, my gut, my stunned heart. And that is more important: if this music doesn’t move us, why would we want to invest time in researching, understanding and playing it? 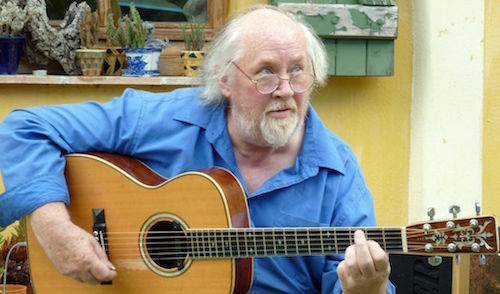 The late, great, extraordinary John Renbourn (1944–2015). This was the first time I had heard early music, but I had yet to hear that label or know what it meant. The Mystery Play experience seared right through me, but I had nowhere to place it. It was a few years later, on listening to folk guitarist John Renbourn’s album, The Lady and the Unicorn, that I first heard a John Dowland piece, played on concertina and acoustic guitar; medieval dance tunes, played on guitar in open tunings and guitar and sitar duet; branles from the danceries of Claude Gervaise on guitar, fiddle and concertina; and J. S Bach, played on electric guitar with heavy tremolo. What a beautiful treat. I read the liner notes and began to understand what early music is. I now had the corner of a map on which I could place Coventry Carol. Thank you, John. In that moment, hearing a voice in the dark singing mournfully, Lully, lulla, thow littell tiné child, I began a journey. I had my first taste of the beauty and power of early music; and I powerfully understood that in music it is never enough to know the notes: the real work of understanding is to climb inside a song and feel its beating heart. Technical musical ability is important, of course, but this is just the beginning, not the goal. For there to be communication between singer and listener, a shared empathic experience, music must be driven by something deeper: emotional truth, akin to that I experienced on an April evening in Coventry. All yonge children to slay. Lovely article, Ian. It was John Renbourn’s playing of Byrd’s Earl of Salisbury on Pentangle’s double album that really started my own interest in early music. I had known of Coventry Carol but not its history. This is beautiful. Thanks so much for this great essay, Ian. But thanks most of all for sharing your beautiful and deeply moving story of your encounter at Coventry with the Truth of Music (if I can put it that way). I visited Coventry a bit over twenty years ago. My memory of the Old Cathedral remains vivid to this day. I can think of only one or two other places that have so filled me with a sense of the Sacred. In such a spot, not only can wonders happen, they must. Thanks also for that great photo of John Renbourn and your account of how he and Pentangle led you to Early Music. For me it was the other way around: early music led me to Pentangle, but I think it was the same kind of revelation. Looking at the picture of John again…such hands! Great big bear paws, just like Segovia’s, that could spin such delicate threads. Damn, I miss him! What a lovely and moving response. Yes, Coventry Cathedral is quite a special place, and I already find myself running out of words to convey the feeling of being there. I met John Renbourn once. He was such a gentle, kind, funny, inclusive man. When I heard the news that he’d died it really upset me, a mark of the impact his music and that one meeting had on me.